Two Kabbalah Red string Bracelet shipped directly from israel to you! 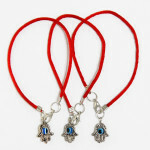 A beautiful Red String Kabbalah Bracelet with silver Hamsa – to negate evil eye, bad luck. instead promote positivity and success! Categories: Hamsa Bracelets, Kabbalah Bracelets.